The diagram to the right shows the major steps in the action of the neurotransmitter dopamine. First, dopamine is synthesized from the amino acid tyrosine. The dopamine is then stored in the synaptic vesicles of the presynaptic neuron until it receives action potentials that cause it to release the dopamine into the synaptic gap by a process called exocytosis. On the post-synaptic neuron, the dopamine then binds to specific receptors that have five different sub-types, designated D1 to D5 , and that are paired with GTP-dependent proteins inside this neuron. The dopamine is subsequently reabsorbed by transporters on the terminal button of the dopaminergic presynaptic neuron. There the dopamine is either stored again in vesicles or broken down by a mitochondrial enzyme called monoamine oxydase. 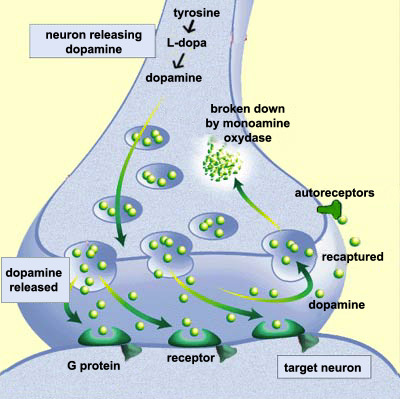 Dopamine can also bind to “autoreceptors” in the membrane of the dopaminergic neuron itself. The stimulation of these receptors generally results in negative feedback to the dopamine neurons. The first evidence of dopamine’s role in the sensation of pleasure came from studies that had shown an increase in dopamine levels in certain parts of the brains of rats that were engaged in gratifying activities. In subsequent experiments, the researchers injected antagonist substances that blocked the action of this neurotransmitter and thus prevented it from binding to its receptors. These blockers had the effect of reducing the animals’ pleasure-seeking behaviours. For example, the animals that received this treatment lost all desire to eat. Other, more recent data now suggest that the release of dopamine can even be triggered by the environment associated with the reward, without the reward itself even having to be present! Dopamine would then be responsible for a whole set of behaviours designed to obtain the reward. We now know that all drugs that create a dependency artificially increase the amount of dopamine in the reward circuits. The release of dopamine thus seems to inform the organism of the possible presence of a reward in a given environment, thereby prompting the efforts to obtain this reward, and thus the reward-seeking behaviour over time. These results therefore suggest that the relationship between pleasure and dopamine is more complex than was originally thought.